The air I to stay alive comes from either an oxygen concentrator or a small oxygen tank, but the life I live comes from Jesus Himself! It wasn’t always that way, when July started I was as independent as someone 71 years old can be. However, as July ends that is not the case pulmonary fibrosis has raised up its ugly head and made me depend on outside sources of air to breath. Yet in spite of my loss of some independence I am more alive today then I was when July began not because of my damaged lungs but in spite of my damaged lungs. When life leaves us slacking Jesus through the Holy Spirit takes up the slack! Prior to July the oxygen equipment I now need was a symbol of the brevity of life and while it continues to symbolize the brevity of life it now has become a symbol of my need for God, Jesus, the Holy Spirit and those who will need to help me be as independent as I can. Throughout the last half of July I have been a war with myself because of the fact I have come face-to-face with the brevity of life. I found myself at war between “poor Gary” and “blessed Gary” most people were not aware of what was going on inside me but Patti was and like John Wayne and the U.S. Calvary coming over the hill she fought hard for me. And together with the Holy Spirit we came out as a “blessed Gary”. And it is that victory I will talk about, write about, and live out for the rest of my life. I know my story is not your story. 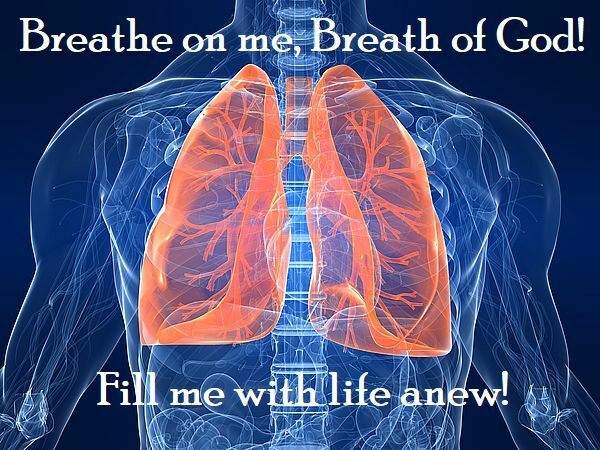 But the truth is the same Breath Jesus breathed into the disciples long ago and same Breath Jesus breathed in me this July is the same Breath He has or He will breath into your life. All you need do is ask and believe on these precious words. And finally, the Twenty-third Psalm has taken on a whole new meaning with a power I’ve never experienced before. Perhaps it will do so for you as well.